Figure 17.8 Section through drift-mantled slopes, Fabergst0lsbreen, Norway. The upper massive clast-supported diamicton represents deposition by the glacier during the Little Ice Age. The underlying crudely-stratified diamicton consists of early Holocene paraglacial debris-flow deposits. The erosional contact between the two demonstrates that the Little Ice Age advance of the glacier reworked the earlier paraglacial slope deposits. (From Ballantyne and Benn, 1994). morphology and the near-surface sedimentological characteristics of proglacial landforms and deposits. In high-latitude permafrost environments, paraglacial modification of recently deglaciated forelands is dominated by slumping and flow of soil from ice-cored moraines (Fitzsimons, 1996a,b; Bennett et al., 2000a) and thermo-erosional incision into ice-cored terrain by meltwater streams. Etzelmüller (2000) has estimated that, on glacier forelands on Svalbard, thermo-erosion of large ice-cored moraines and slumping of sediments into the resulting icewalled channels generates a specific sediment yield of 400—960 t km-2 year-1, and thus forms a major component of sediment loss. Solifluction is also of widespread importance in modifying foreland topography in both arctic and alpine environments, particularly at the margins of retreating glaciers where sediments often contain abundant water, and may significantly modify the form of both moraines and subglacial bedforms. Slope measurements on recently deposited annual or recessional moraines show that initially steep gradients are reduced to stable angles within a decade or so (Welch, 1970; Sharp, 1984; Fig. 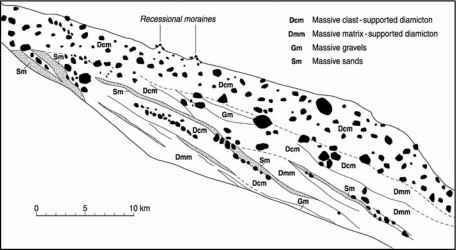 17.9), implying that many recessional moraines and other depositional landforms rapidly lose both their original form and near-surface structure (Rose, 1991). Near-surface sediment structure may also be altered by frost-action processes. Lateral sorting of clasts into miniature sorted nets has been observed on several forelands (Ballantyne and Matthews, 1983; Krüger, 1994b), and the formation of large-scale sorted circles up to 3 m in diameter on recently deglaciated terrain (Ballantyne and Matthews, 1982) may imply convective soil movement within a saturated dilatant layer of till exposed by glacier retreat (Boulton and Dent, 1974). On the foreland of Styggedalsbreen in Jotunheimen, Norway, Matthews et al. (1998) recorded a range of frost-action phenomena, including sorted nets, sorted stripes, surface cracks, boulder-cored frost boils produced by the upfreezing of large clasts, miniature solifluction lobes and ploughing boulders, all of which imply widespread disruption of near-surface glacigenic deposits. Wind erosion may also modify unvegetated recently deglaciated terrain. In Iceland, Boulton and Dent (1974) observed rapid loss of surface fines due to deflation by strong katabatic winds, forming a stony lag deposit overlying till. 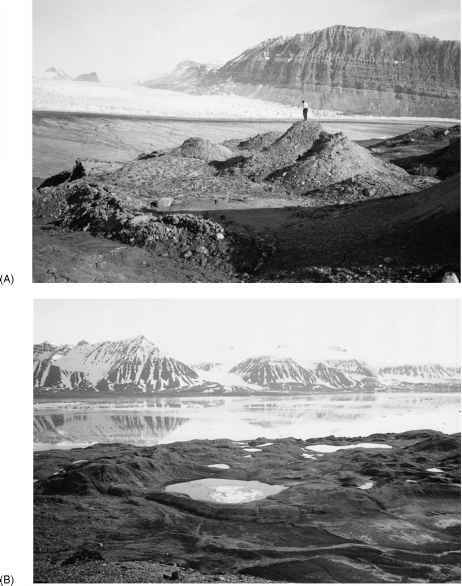 On Svalbard, aeolian erosion of push moraines composed of silts and fine sand deposits has planed off the original relief, causing significant surface lowering (Riezebos et al., 1986). Aeolian deposits may also accumulate in hollows on recently deglaciated forelands (Derbyshire and Owen, 1996), and particularly on outwash plains where unvegetated overbank deposits are exposed during periods of low streamflow (McKenna-Neumann and Gilbert, 1986). Slopewash and rainsplash also play an important role in redistributing sediment within sparsely vegetated glacier forelands (Rose, 1991; Krüger, 1994b; Fitzsimons, 1996b; Matthews et al., 1998), sometimes forming miniature fans of reworked silt and sand (Theakstone, 1982). A more subtle effect of water movement on recently deglaciated terrain is downwash (eluviation) of silt and clay from surficial sediments, particularly where the uppermost sediment comprises dilatant till of high permeability. Boulton and Dent (1974) showed that the uppermost layers of such deposits experience rapid loss of silt and clay particles, which initially accumulate at the base of the dilatant layer and are then translocated more slowly through the underlying compact till. 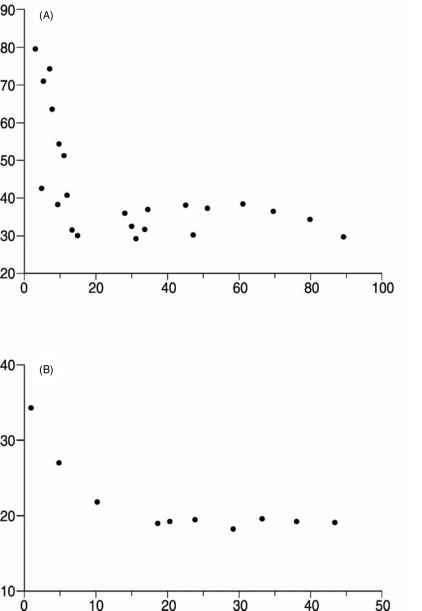 Figure 17.9 Changes in the maximum gradients of recessional moraines. A) Maximum gradients of recessional moraines on the foreland of the Athabasca Glacier, Canada (from Welch, 1970). B) Mean maximum gradients of recessional moraines on the foreland of Skalafellsjokull, Iceland (from Sharp, 1984). Hammer and Smith (1983) compared the sediment load in the meltwater stream at the glacier snout with that 1 km downstream. Their data imply an average enrichment of 80 per cent of suspended load and about 37 per cent of bedload between the two points, with much greater sediment increases during episodes of bank collapse. They concluded that erosion of channel banks cut into recently exposed till provides a major portion of total sediment load at the downstream sampling point, and that sediment yields are at or close to their peak rates due to paraglacial reworking of glacigenic deposits. As banks stabilize and vegetation colonization reduces sediment input due to slopewash, sediment yields decline significantly. Leonard (1985, 1986) has shown that maximum sediment input into a distal proglacial lake coincides with the initial phases of ice retreat from readvance maxima, and attributed this to the exposure of unstable glacigenic deposits to fluvial erosion. The most significant effects of paraglacial modification of glacier forelands are sediment redistribution, relief modification and changes in sediment characteristics. Sediment redistribution and relief modification are accomplished by mass movement, slopewash and streamflow, although wind erosion may also be locally significant. The characteristics of surficial sediments may be altered by slumping, solifluction, slopewash, lateral and vertical frost sorting, downwash of fines and deflation. Most paraglacial processes operating on glacier forelands, however, are effective only over a decadal timescale (Matthews et al., 1998). Their effects nonetheless have potentially important consequences, as they imply rapid and significant modification of both the form and near-surface sedimentological characteristics of proglacial landsystems (Boulton and Dent, 1974; Rose, 1991).